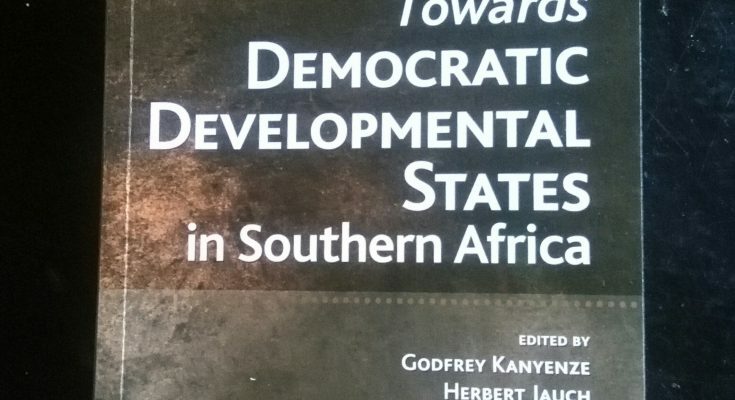 The book ‘Towards Democratic Developmental States in Southern Africa.’ explores the genesis and evolution of the ‘developmental state’ concept flagging out useful lessons from the East Asian tigers and presents the conditions necessary for the emergence and consolidation of a ‘democratic developmental state’ in Southern Africa. Authored by renowned authors, an important lesson emerging from the book, according to Peter Mutasa, the President of the Zimbabwe Congress of Trade Unions (ZCTU) is the fact that development is not a miracle and an accident. “In fact it is a misnomer to call development a miracle. Another vital lesson from the book is that any country can attain sustainable development. This truth is supported by the fact that in 1980 many Southern African countries were relatively more developed than many of the East Asian tigers. The book therefore provides hope and inspiration to Southern African countries that a democratic developmental State is a possibility in the twentieth-century if the right conditions are put in place,” Mutasa said. The launch in Zimbabwe came came at a time when the Zimbabwean economy is undergoing wrenching structural regression characterised by persistent de-industrialisation and in-formalisation. Recently, between 2011 and 2014 it was established that 4,610 companies closed, affecting 55,443 workers. According to recent statistics from the Ministry of public service, Labour and Social Welfare, 2,120 workers were retrenched during the first half of 2017, representing a 16 per cent increase from the 1,825 workers retrenched during the first half of 2016. The share of informal employment in total employment increased from 80 per cent in 2004 to 84. 2 per cent in 2011, and 94.5 per cent in 2014. The majority of informal economy workers are at the very bottom of the economic and social ladder, working under precarious conditions without access to any form of social protection. They typically suffer from a deficit of decent work, with their work being casual, ‘unprotected,’ ‘excluded,’ ‘unregistered,’ or ‘unrepresented.’ The worst affected are the youth, who have little labour market experience. The 2014 Labour Force Survey reveals that as much as 98 per cent of the currently employed youth aged 15-24 years and 96 per cent of currently employed youth aged 15-34 years were in informal employment. Furthermore, about 72 per cent of the population is living below the national poverty line. The trade unionists said past development policies lacked a consistent pro-poor and inclusive framework that puts people and their needs first. The launch comes at a time when the government has embarked on a process of re-engagement with the international community. The book seeks to inspire the nation to unite around a common vision of ‘eradicating poverty’ and laying a solid foundation for the attainment of sustainable human development. It will create a platform for national dialogue around key issues that affect the welfare of Zimbabweans. An economic development expert, Dr. Jabusile Shumba said the conceptual foundations of the book sought to address inequality and unemployment in pursuit of building a democratic developmental state. He said it also focuses on giving a narrative of the historical narrative of the political economies of various countries. Shumba said the highlights of the book are the high levels of income inequality in Southern Africa and a constrained civil service by political development and corruption. “This logic runs against Weberian bureaucratic rationality, which emphasises meritocratic-based recruitment and bureaucratic insulation from particularistic interests. The outcome of deployment has been subordination of supposedly constitutionally independent institutions to the ruling party; preference for political disposition over competence regarding appointments to a wide range of bodies resulting in inefficiency and service delivery failures,” Shumba said. He also blasted the reliance on the extractive industry without structural transformation. The economist said in Angola, oil revenues account for three quarters of domestic revenue and half of the Gross Domestic Product (GDP). In Namibia, the mining industry brings in half of the country’s foreign earnings. With the exception of South Africa, there is little – although some strategies aimed at local value addition or formation of value chains in Angola, Namibia and Botswana. In the region, the manufacturing sector is very weak and insignificant, contributing an average of 10 percent to GDP in countries such as Zimbabwe, Namibia, Botswana, Angola and Malawi. South Africa stands at 15%. Judith Kaulem, the Director of the Poverty Reduction Forum Trust said the resource curse paradox is one that occupied many debates in the book. She said Zimbabwe has failed to develop appropriate interface between social and economic policies and the values that should underpin public policy, in particular core values of equity, solidarity and redistribution. Kaulem said a series of blueprints by the government prematurely died due to the lack of implementation spurred by financing challenges and a lack of political will to implement them. “We do not see commitment from policymakers for domestic resource mobilization towards the common good. Instead, what we see is government transferring the responsibility for funding of most of our development needs to donors. What we need are state-directed strategies that combine economic development objectives with active social policies and forms of politics that elevate the interests of politics that elevate the interests of the poor in our society,” Kaulem said. She said poverty has a rural and urban face that of the elderly, people with disability, women the youth and the unemployed. Structurally, poverty is higher in the rural areas than in the urban centres. The 2030 Development Agenda aims to end poverty in all its foprms and emphasizes on inclusiveness. According to the 2012 Census report, 36% (47% male and 53% female) of the Zimbabwean population is between 15 and 34 years of age with a further 41% below 15 years of age. The problems faced by young women and men of unemployment and under-employment in a shrinking labour market are compounded by high exposure to risk in regard to sexual and reproductive health (SRH), in particular in respect of HIV/AIDS, in an environment where young people, particularly young women, are marginalised from positive civic and social engagement. Lucy Mazingi, the Director of Youth Empowerment and Transformation Trust (YETT) said young people are excluded from governance and development processes at the local, national, regional and global processes. “This is all reflected in lack of economic opportunities, the growing inequality, insecurity and low levels of the quality education- also manifest as lack of opportunities for education, academic freedom and opportunity to fully realize fundamental rights and freedom of just enjoying and expressing themselves as youth as enshrined in the Constitution, particularly under the national objectives chapter 2 Section 20,” Mazingi said. She said the Constitution requires that the state and all institutions and agencies of government should ensure that youth should have appropriate education and training; opportunities to associate and to be represented and participate in political social economic and other spheres of life and be protected from harmful cultural practices exploitation and all forms of abuse. The book reveals that the dawn of the twenty-first century heralded an apparent change of fortunes for most Sub-Saharan economies, with annual growth averaging over 5% for fifteen years. However, this was not accompanied by structural transformation: poverty, food insecurity, unemployment and inequality persist. Distinguished authors including Dr. Jesimen Chipika – a development economist; Dr. Godfrey Kanyenze the Director of the Labour and Economic Development Research Institute of Zimbabwe and Masego Madzwamuse, the Team Leader of the Open Society Initiative for Southern Africa (OSISA)’s social and economic justice cluster authored the book, among others.